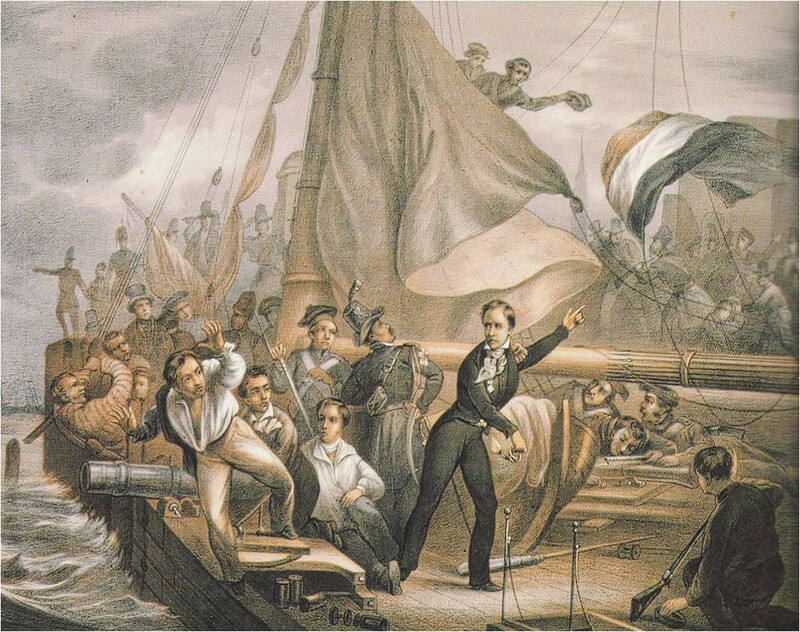 Around 1831 there was a Dutch navy commander who was 29 years old. He had fought in one war in the current Indonesia, got a medal and was promoted being a captain on a small vessel: a gunboat with merely one cannon and around 32 crew. Van Speyk was sent out when the Belgian war of independence started: he went to Antwerp to play a kind-of border control. The harsh wind took him to the shore where an angry Belgium mob was waiting for him. Van Speyk didn’t hesitate for a moment, grabbed a sigar and exclaimed: ,,Dan maar liever de lucht in’’, which translates as: ,,I’de rather kill myself’’. And so he did: he blew a big chunk of gunpowder below deck causing a huge explosion on board killing 28 of the 31 crewmembers. If van Speyk lived today, I’m pretty sure he would made a awesome blockchain consultant advising his clients to go full on blockchain technology. True blockchain innovation takes away a so-called third party. This has to do with the core principal of blockchain: transactions are validated with the help of distributed computer power called mining. Corporates do this validation themselves, for instance: insurance companies keep a database of all the insurances. And they keep track on when someone actually needs a payout. If lots of people need their insurance it’s likely that the commission will rise. Their business model is being a third party: the better they monitor the better their business model works and the more profitable the business will be. Startups building value propositions around the blockchain are basically replacing existing third-parties, such as banks, insurers, notaries or (real) estate models. This is called disruptive innovation, which I’m sure you’ve heard about dozens of times. Rushing to remodel your existing Value Proposition directly into the blockchain within a corporate is basically the same as running below deck with a sigar: if we cannot win the war; we might as well blow ourselves up. Sane innovators should look for opportunities where Blockchain tech does prove a value which can be monetized: not by acting as a third-party but by adding specific domain-knowledge into a ledger as a form of openness or transparency. And create new value by using this (semi) open data. Picking reliable technology is no easy task. There are a lot of API’s available but almost zero have any track record in proven and reliable applications. So, picking Etheureum could be a good choice, but will it last? Picking some hot ICO could be good, but it may as well be a scam. And there’s the complexity. Despite excellent work from blockchain ambassadors it’s still a complex set of rules. A set of rules which are a bit flexible to explanation. And some white-noise: bitcoin is doing great thus clouding the opinion on blockchain ór making it more suspicious. Transformational innovation is still a scary place. Building a radical new business model that could cripple the current business is super risky and therefore toxic. Your board or CEO’s have to have big balls and deep understanding of underlying technology to approve any project, big or small. Don’t be a van Speyk. Start modeling new experiments to kickstart small projects and learnings out of a distributed setting. Find out what works for you and your customers. Your job as a (corporate) innovation leader is to systematically reduce the risk & uncertainty of new ideas.